Most people had fun and relaxing plans for Canada Day long weekend, but not Amy and me. We decided that we should make furniture for her condo balcony. The furniture turned out amazing! From color to fit, it worked out perfectly. 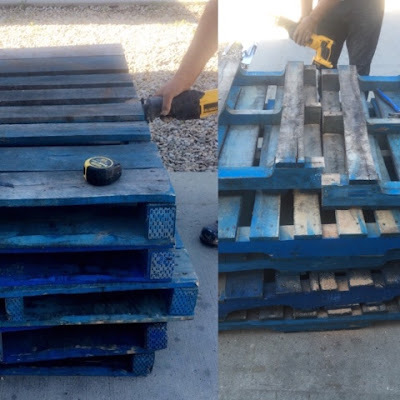 Cut the pallets into desired size. We cut the pallets in half. Electric saw worked perfectly, even though we were not allowed to operate it (Thanks Dad). Sand the edges and sides. Sand the entire surface of the pallet that will be on top. 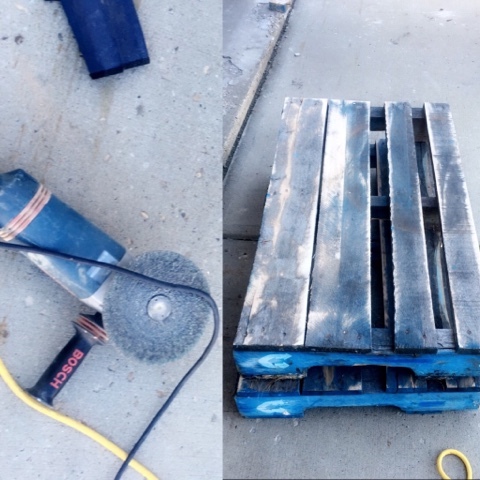 We used sand paper on smaller edges and touch ups and the grinder for larger surfaces. 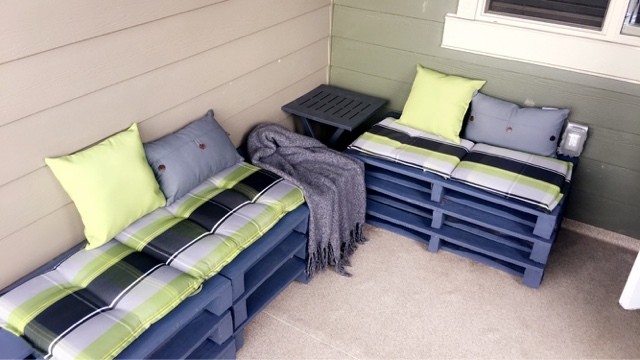 Set up the pallets in ohe rder you will have them on your patio. Paint all sides and top. We did one coat and few touch ups. Getting half a gallon of paint would be plenty as we had about half the paint left. Watch the paint dry ... with a drink, naturally. Using a drill, you can fasten the benches together by adding two nails on each level, both sides of the bench. We didn't do this as the pallets stacked up on their own are very steady. The furniture fits perfectly. 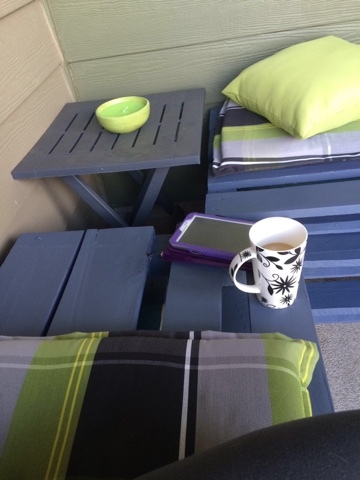 I used it the first morning to read my book and have a coffee; comfort level 10! I've also had the opportunity to stretch out flat and suntan. This set couldn't be more amazing for my little balcony! 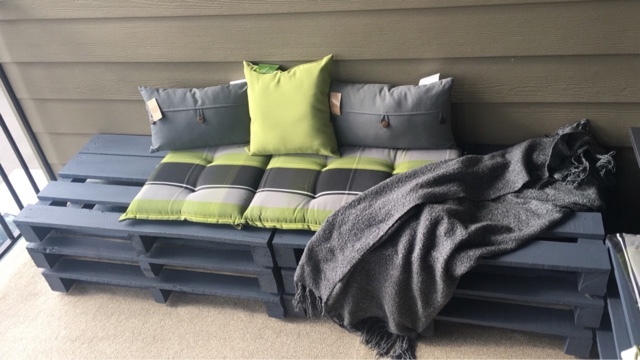 I couldn't buy a more durable and unique set of furniture for less than $200 anywhere! DIY success. 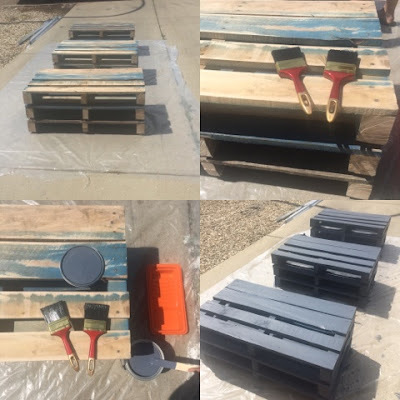 If you are looking for more way to use pallets check out this comprehensive article on 35 Creative Ways To Recycle Wooden Pallets. What is your next DIY project? Good work.I am also impressed from your work.After watching your work i also got an idea to make bed frames victoria bc from wooden pallets.